Thought this was pretty funny. I went to the gym to do some lifting. Please put the heavy weights back so I can move the bar up and down." How creative a message was that! 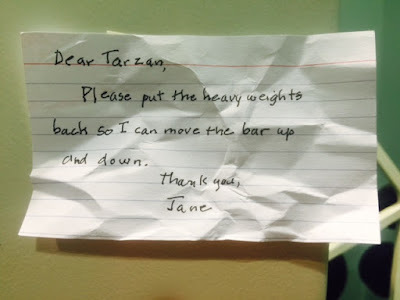 Tarzan and Jane, nice sense of humor. Effectively asks for what she wants--put away the weights when you're done! Is polite about it--please and thank you. Must've worked because the bar was unencumbered and moving up and down fine, and there was no leftover heavy weights to be found. Should We Care What Others Think?